Benzodiazepine Withdrawal Syndrome (BWS) is a serious physiologic condition associated with benzodiazepine (BZD) dependence and discontinuation, even from normal or low doses. Most people suffering BWS/PWS from prescribed BZDs are not addicts and have taken their medicine as directed by a healthcare professional. 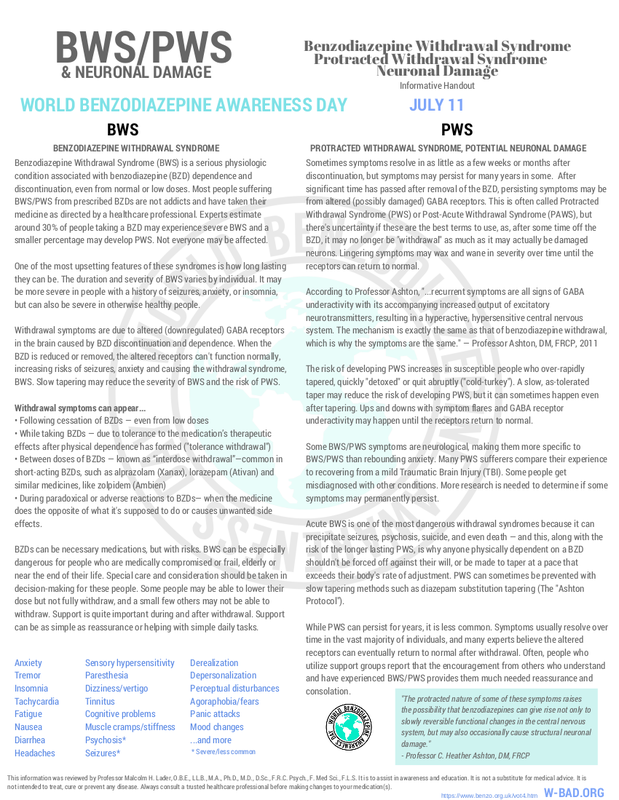 Experts estimate around 30% of people taking a BZD may experience severe BWS and a smaller percentage may develop PWS. Not everyone may be affected. One of the most upsetting features of these syndromes is how long lasting they can be. The duration and severity of BWS varies by individual. It may be more severe in people with a history of seizures, anxiety, or insomnia, but can also be severe in otherwise healthy people. Withdrawal symptoms are due to altered (downregulated) GABA receptors in the brain caused by BZD discontinuation and dependence. When the BZD is reduced or removed, the altered receptors can’t function normally, increasing risks of seizures, anxiety and causing the withdrawal syndrome, BWS. Slow tapering may reduce the severity of BWS and the risk of PWS. During paradoxical or adverse reactions to BZDs― when the medicine does the opposite of what it’s supposed to do or causes unwanted side effects. BZDs can be necessary medications, but with risks. BWS can be especially dangerous for people who are medically compromised or frail, elderly or near the end of their life. Special care and consideration should be taken in decision-making for these people. Some people may be able to lower their dose but not fully withdraw, and a small few others may not be able to withdraw. Support is quite important during and after withdrawal. Support can be as simple as reassurance or helping with simple daily tasks. Sometimes symptoms resolve in as little as a few weeks or months after discontinuation, but symptoms may persist for many years in some. After significant time has passed after removal of the BZD, persisting symptoms may be from altered (possibly damaged) GABA receptors. This is often called Protracted Withdrawal Syndrome (PWS) or Post-Acute Withdrawal Syndrome(PAWS), but there’s uncertainty if these are the best terms to use, as, after some time off the BZD, it may no longer be “withdrawal” as much as it may actually be damaged neurons. Lingering symptoms may wax and wane in severity over time until the receptors can return to normal. The risk of developing PWS increases in susceptible people who over-rapidly tapered, quickly “detoxed” or quit abruptly (“cold-turkey”). A slow, as-tolerated taper may reduce the risk of developing PWS, but it can sometimes happen even after tapering. Ups and downs with symptom flares and GABA receptor underactivity may happen until the receptors return to normal. Some BWS/PWS symptoms are neurological, making them more specific to BWS/PWS than rebounding anxiety. Many PWS sufferers compare their experience to recovering from a mild Traumatic Brain Injury (TBI). Some people get misdiagnosed with other conditions. More research is needed to determine if some symptoms may permanently persist. While PWS can persist for years, it is less common. Symptoms usually resolve over time in the vast majority of individuals, and many experts believe the altered receptors can eventually return to normal after withdrawal. Often, people who utilize support groups report that the encouragement from others who understand and have experienced BWS/PWS provides them much needed reassurance and consolation. This information was reviewed by Professor Malcolm H. Lader, O.B.E., LL.B., M.A., Ph.D., M.D., D.Sc., F.R.C. Psych., F. Med Sci., F.L.S. It is to assist in awareness and education. It is not a substitute for medical advice. It is not intended to treat, cure or prevent any disease. Always consult a trusted healthcare professional before making changes to your medication(s).